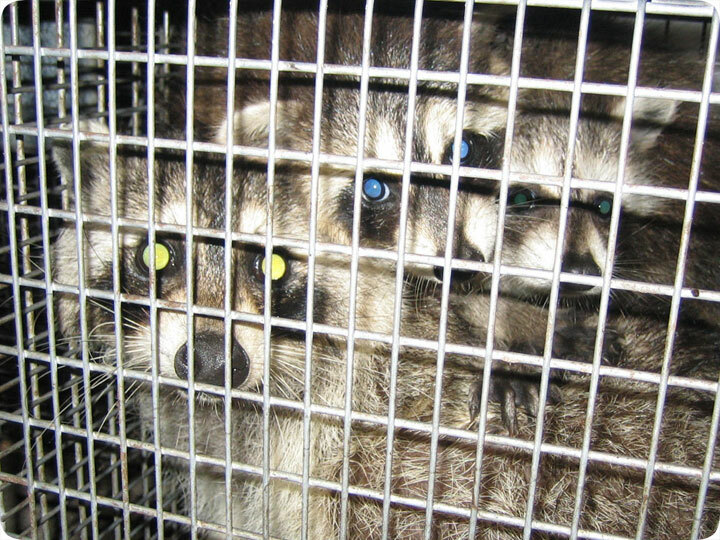 04.01.2004 - This is a photo of a mother raccoon and two of her baby raccoons. The babies have grown to a decent size, and are about ten weeks old at this point. I removed them all from the attic of a home. I actually removed the young raccoons manually, with a snare pole, and then set one each in the back of two traps. The mother went in the trap to get her babies, and I caught her. I then reunited them all. In this photograph, the young are clinging to mom, and I took the photo of all three together. In people during photographs, the light of the flash will often reflect against the retina of the eye and cause red eye in photographs. The same thing happens to many wild animals, such as raccoons, but since raccoons are nocturnal, like many nocturnal animals, they have a special layer called the tapetum lucidum layer, in their retinas. This layer reflects light and assists in night vision. That's why many animals' eyes will glow in response to light. This glow reflects a whole spectrum of colors. In this photo, the three racoons are at different angles, and thus different colors are reflected. Neat!